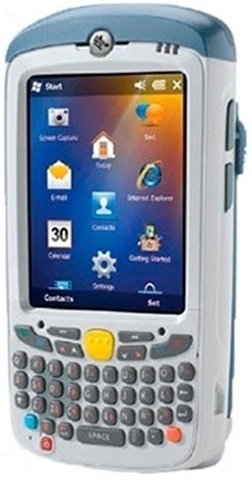 MC55X-HC HealthCare is a robust IP64 compact handheld Windows Embedded Handheld 6.5 Classic mobile computer with Bluetooth 2.1 & WLAN (IEEE 802.11a/b/g/n) specifically for the healthcare industry, which was specifically conceptualized for the extreme conditions in the healthcare industry. Thanks to special housing, the terminal withstands multiple cleanings with aggressive disinfectants. The IP64 certification keeps the MC55X-HC protected against the ingress of dust and splash water, simplifying usage in laboratories and patient environments. Even repeated drops from heights up to 1.8 m do not affect the terminal. But patients and caregivers should also not neglect data security — thanks to VPN (Virtual Private Network) and a FIPS 140-2 Level 1 certification, the data is more secure than ever, without compromising performance and efficiency. WLAN (IEEE 802.11a/b/g/n) and Bluetooth 2.1 ensure for simple communication with wireless networks. Thus, patient files are always up to date. Capturing 1D and 2D barcodes with the integrated imager is also easier than ever, thanks to Zebra’s PRZM intelligent imaging technology. With the MC55X Series, managers and task workers who spend their days inside your company walls have everything they need to take instant action, anywhere in your facility — indoors and outside. When it comes to meeting the needs of your workforce, the MC55X excels, offering the right level of features, the right level of rugged design and support for the most demanding business applications. The result? Workers in retail, hospitality, manufacturing, healthcare and government agencies can complete more tasks more accurately in less time, improving productivity and customer care. And with healthcare friendly colors, MC55x-HC brings mobility to point-of-care applications, helping nurses and other caregivers eliminate errors at the patient bedside to improve the quality of care — and the patient experience. The MC55X Series is the perfect blend of form and function. The comprehensive capabilities allow workers to scan barcodes; snap pictures; view videos; access business applications, the Internet and email as well as make and receive private and push-to-talk voice calls. The compact and lightweight mobile computer is easy to carry and easy to use, with a sleek design that is equally at home in front of customers and patients. The MC55X Series is built to last, giving workers a device they can count on and businesses a maximum return on investment (ROI). This rugged device family is built for use inside your buildings as well as outdoor areas of your facilities and our toughness tests prove it. The MC55X delivers outstanding performance, even after exposure to heat, cold, dust, water — and 1,000 consecutive tumbles in our rotating tumble drum. And all models can be sanitized with many common cleaners without harming the housing or the sensitive electronics, helping prevent the spread of bacteria to patients and caregivers in a hospital as well as shift workers in other industries where devices are shared. addition to bar codes, no problem just add our high-resolution 8MP autofocus colour camera. Wireless solutions create an instant concern for businesses and government agencies — data security. In addition to standard support for all the latest wireless authentication and encryption protocols and Zebra’s tested and certified Virtual Private Networks (VPNs), the C55X adds native FIPS 140-2 Level 1 certification, bringing government grade security to businesses and government agencies alike. Unlike many other mobile computers, our security features protect your data and productivity, without impacting performance.